Is traditional camp better than sports camp? Why choose a traditional camp, like Camp Quinebarge, over a sports camp? This is a common question as kids are becoming more and more specialized in sports. There is a simple reason that for over 80 summers, campers have returned to Camp Quinebarge again and again. At Quinebarge campers have a life expanding experience where they will get to play their sport, but also participate in a wide range of other activities that encourage them to develop socially and physically and help them become more independent. Campers choose from a wide range of sports, ropes, arts and crafts, nature, and boating. The campers choose Quinebarge over Sports camps because at Quinebarge they do get to play sports but more importantly, they make everlasting friendships, play to have fun and not worry about who wins or loses, and can build other athletic skills playing a variety of sports or challenging themselves on our ropes course and rock wall. Quinebarge is dedicated to the whole camper and provides experiences they will cherish for life. 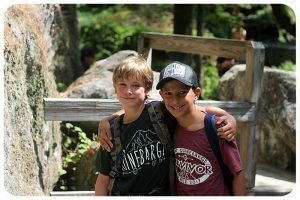 During the first couple of days of Camp kids really get to know their cabin friends and other kids at Camp Quinebarge very quickly. 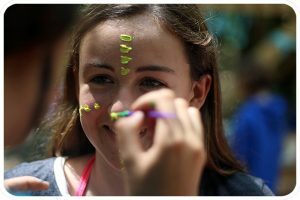 Our trained staff play a number of different fun ice breakers and get-to-know-you games so that the campers learn about and bond with each other. With our schedules set up so that campers choose what they want to do they make friends with not only kids in their cabins but with all other campers at Quinebarge. Kids go home from Quinebarge not only with best friends in their cabins but with multiple kids from different cabins. At Quinebarge it is important to have the most fun you have ever had in your lifetime. That is why we focus on the experience of having fun playing sports you know and sports you may never have seen, and not on winning or losing. As long as you try you’re a winner at Camp Quinebarge. 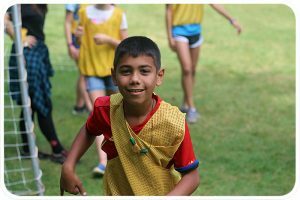 Camp has a wide range of sports from soccer, basketball, baseball, and tennis to cricket, Quidditch, Newcomb ball, laser tag, Gaga ball, and capture the flag. Non sports activities include nature, arts and crafts, woodshop, horseback riding, and boating all offered to every camper. The ropes course at Quinebarge is one of our most popular activities. The course has low and high elements, and each challenges campers to step out of their comfort zone and accomplish a task they never thought they could, like going down the zip line or climbing to the top of the rock wall and ringing our bell. During each challenge friends, counselors, and cabin mates cheer each other on. Both courses are supervised by our highly trained ropes staff and meet Association for Challenge Course Technology (ACCT) standards. Why choose a traditional camp over a sports camp?, Your child will make everlasting friendships as well as playing sports, and having new and unique experiences everyday. 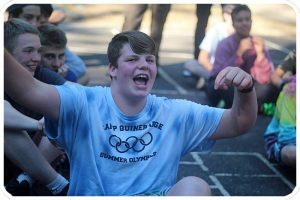 If you would like to further read about the importance of going to a traditional camp please link to our camper reflections in our “Because of Camp I” blogs, particularly by Nate P, a championship swimmer, wrestler, and rower who cherishes his summers at Camp Quinebarge.